Number one of my priority list is to get the program of the Independence Day feasts and activities, and some invitations for the various shows at Bahti Meskerem and the Asmara Stadium. The invitations are distributed to various ministries, administrations, and government organisations So you need an insider, or a friend or family member that knows an insider. By now I have many friends, family members, and insiders willing to help me. Before noon I have three entry cards for May 17, 18 and 19, the complete (evening) program in Bahti Meskerem (Many thanks to you, Tadesse!). The rest of the day is for the family, friends and the distribution of copies of last years pictures. To complete the program, I pay visits to offices that may have information to update my agenda, like the Ministry of Tourism and travel agents. There is nothing to add to the program. There will be some small exhibitions and the usual program in the Expo area (live music in night clubs). But I should not complain with three invitations for cultural shows, drama and music for the coming three evenings. Government workers are energetically engaged in decorating the main streets between Nacfa house and Bahti Meskerem, that will be the scene of music stages and carnivals in the coming week. 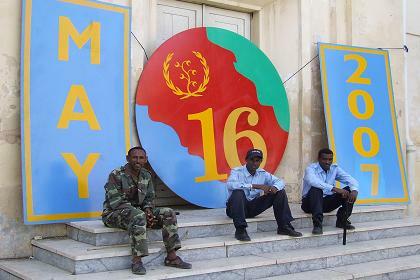 Owners of shops, bars and offices are making their contribution to the celebration of the 16th Anniversary of Independence, adding banners, paintings and colorful illumination to their windows or facade. This year's Independence Day theme is 'Today's Investment: Tomorrow's Prosperity', referring to the further implementations of the Warsay Yekealo Campaign, carrying out a nation wide investment in roads, dams, potable water supply, health centers, schools, transportation, communication services and an airport. These developmental works, through hard work and careful investment, are carried out solely on Eritrea's own internal resources and capabilities, without waiting for aid from others. The eastern end of Harnet Avenue is closed for all traffic. Iron barriers block the street. 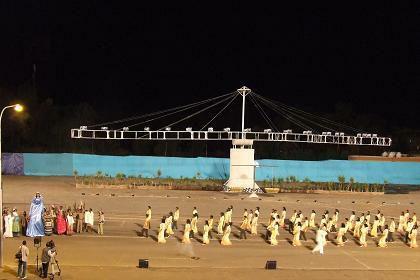 Students, dressed in blue with yellow uniforms check the visitors invitation cards. The police and military check the content of bags taken into the stadium. 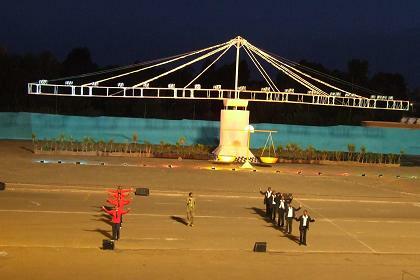 The show starts around 19:00 with a hymn and one minute of silence to commemorate the Martyrs. A short speech, and then a enjoyable program of songs and drama, watched by some ten thousand Asmarino's gathered on the grand stand of Bahti Meskerem. Today's Investment (Warsay Yekealo Campaign), Tomorrow's Prosperity! 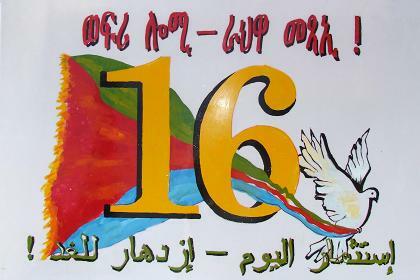 Theme of Eritrea's 16th Independence Day - Asmara Eritrea. Semaetat Avenue - Asmara Eritrea. 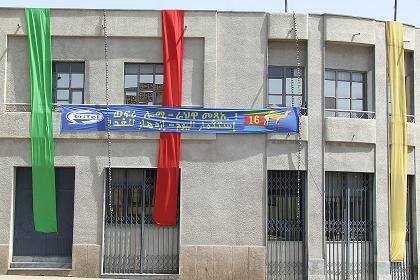 Decorated Eritel offices - Harnet Avenue Asmara Eritrea. 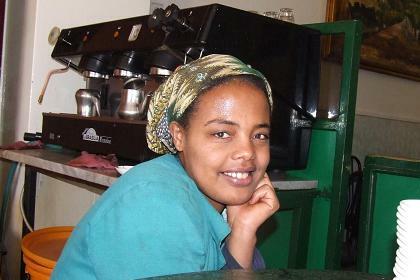 Mebrak Hailab - Cathedral Snack Bar Asmara Eritrea. 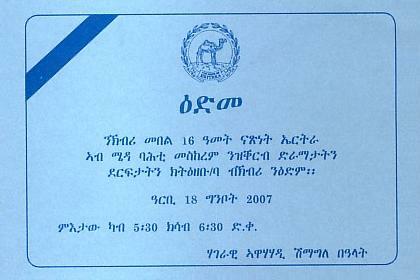 Invitation for the evening show - Bahti Meskerem Square Asmara Eritrea. 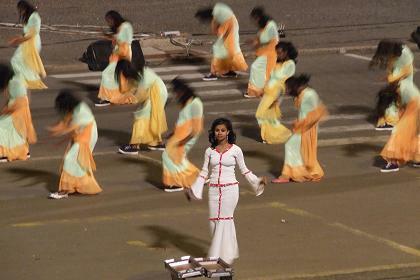 Live entertainment - Bahti Meskerem Square Asmara Eritrea. 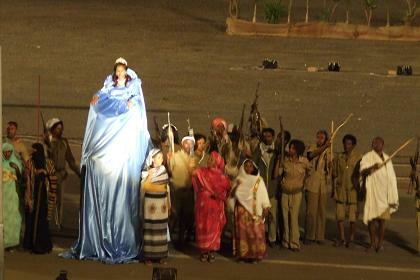 Musical drama - Bahti Meskerem Square Asmara Eritrea. 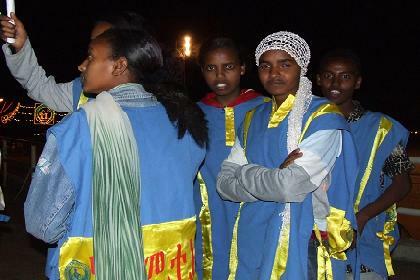 Students maintaining order - Bahti Meskerem Square Asmara Eritrea.